There was a Yestival Wednesday night at the Palace Theatre in Greensburg. What’s a Yestival, you ask? Well, first you take prog-rock pioneers Yes, mix in some pop-rock soul from Philly with Todd Rundgren, and build it on the steady beats of former Emerson, Lake & Palmer drummer Carl Palmer and his ELP Legacy. The event began as Palmer took the stage waving a Terrible Towel. His drum kit occupied the front and center of the stage and consisted of two bass drums along with the regular drums and cymbals. Two large gongs sat behind him. Palmer was flanked on the left by a lead guitarist and on the right by a bassist. There was no vocalist as Palmer’s songs were all instrumentals. 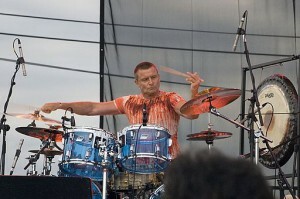 Palmer’s energetic set included ELP hits “Knife-Edge” from their first and self-titled album, “Karn Evil 9: 1st Impression—Part 2 ” (“Welcome back, my friends / To the show that never ends”) from Brain Salad Surgery, and “Lucky Man.” Palmer dedicated “Lucky Man” to late ELP bandmate Greg Lake, whom Palmer said wrote that song at age 10. The rapid and proficient Palmer delivered a most amazing 10-minute drum solo, during which he played different musical pieces on various parts of his drum kit. At one point, he played the two bass drums and used two soft sticks to play the two gongs behind him. Palmer got the crowd warmed up quickly and was rewarded with loud applause and a standing ovation by many. His set lasted a half hour. 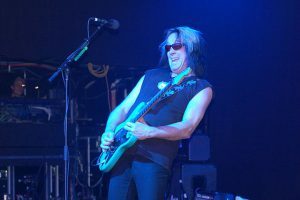 Todd Rundgren jamming in concert in 2009. photo: Carl Lender. After a brief intermission, Todd Rundgren came on stage amid fog and many narrow beam spot lights. Dressed in a black suit, red tie, and shaded glasses, he launched into the first song of the set, “Come,” off of his latest album, White Knight, released in March. During the song, two background singers wearing leather dresses and sporting short black hair danced with red hand fans, while the whole stage was bathed in red light. On “Rise,” he sang about time ticking away if we don’t rise. He and the singers moved their hands like the hands of a clock ticking forward. A little bit into the set, Rundgren changed from his suit jacket into a vest and put on a green Stratocaster guitar. The women also changed from their dresses into black shorts and black fishnet tops with red bras underneath. The talented singer/dancers exuded sexuality and charisma at the same time and sported broad smiles for most of the set. In introducing the band, Rundgren said there were a few Pennsylvania guys in the band and introduced them. During one of the more poppier dance tunes, possibly “Party Liquor,” he joked with the crowd after the song that they probably weren’t expecting that at a prog-rock show. During his new song, “Buy My T,” about selling merchandise, he and the singers each threw a rolled-up T-Shirt to the audience. Rundgren sounded good, and the band was tight musically and harmonically throughout their set. There were a few more songs from White Night, and he even played two from his Utopia days, including “One World.” With 26 albums, Rundgren had many songs to choose from, so not everyone got to hear his or her favorites. He did play the big hit “Hello It’s Me” and the melodic “Just One Victory.” Missing were “Bang the Drum All Day,” “Can We Still Be Friends,” and “I Saw the Light.” Rundgren is to be commended for continuing to produce high-quality music with insightful and sometimes humorous lyrics. Rundgren’s set lasted approximately an hour. This Yes tour has had the same lineup since 2015 of guitarist Steve Howe, drummer Alan White, keyboardist Geoff Downes, singer Jon Davison, and bassist Billy Sherwood. (There’s also a separate touring group called Yes Featuring Jon Anderson, Trevor Rabin, Rick Wakeman. Isn’t rock and roll grand?!). Howe and White have been with Yes almost from the beginning and helped to contribute to the band’s early success. On this tour, the band is featuring songs from the group’s first 10 albums up to 1980. So their highly successful 1983 album, 90125, and other subsequent albums were not included in this tour’s sets. Howe said, “We often passed by Greensburg before while on the road, but this time we stopped by to say hi.” The third song gave a high-profile look at what makes this band great with “Yours Is No Disgrace.” From 1971’s The Yes Album, the song featured high-register harmonic singing and fantastic guitar and keyboard parts as well as a driving bass and drum rhythm section. The tight, sharp tempo breaks make it a longtime favorite of Yes fans. “No Disgrace” will still sound innovative 20 years from now. 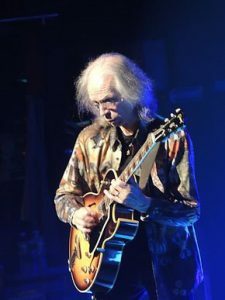 Steve Howe playing his Gibson ES-175 guitar in a 2013 concert at the Beacon Theater. photo: SolarScott and Wikipedia. Howe played two different guitars on the song. One was his semi-acoustic Gibson ES-175 and additionally a green Gibson solid body. His virtuous guitar playing during the lead parts was exciting to watch. All band members especially shined including newer lead singer Davison, who sounded right on with the vocals. Howe also played a red Gibson Les Paul on several songs. Howe mainly played on the left side of the stage with Davison front and center and Sherwood to the right. Behind Sherwood was White and his kit. In the middle was Downes with his keyboard/synth station facing the rear, which gave fans a good opportunity to witness his keyboard prowess. To the left of Downes was a second kit manned capably by Howe’s son Dylan, who’s playing 31 dates of the tour. He’s probably picking up some strong additional percussion insights by playing with White and seeing the opener Palmer. White and Dylan even performed a double drum solo during one of the songs. A mid-set highlight was “And You and I” from ’72’s Close to the Edge. During the song and others, various animated Yes imagery of waterfalls, earth, and sky played on the screen. During “Soon” from ’74’s Relayer, Howe showed his versatility by playing a slide guitar during certain parts. On several songs, Howe had one guitar strapped over his shoulder, while he played another lead guitar in front of him on a stand, switching back and forth during the songs. Davison also showed himself to be an accomplished acoustic guitar player, performing with it on several songs. “Going for the One” off of the 1977 album of the same name provided a funky, country-influenced jam with great vocal harmonies and slide guitar from Howe. Another show highlight was the last song in the encore, “Roundabout,” from 1971’s Fragile. Like “No Disgrace,” it featured quick tempo breaks and jamming from all members of the band. Howe’s guitar, Downes’s keyboards, and Davison’s vocals all shined brightly. The song ended their encore, and the audience, full of very knowledgeable and enthusiastic Yes fans, gave the band a rousing send off. It’s easy to see why the Rock and Roll Hall of Fame finally admitted Yes this year. Like Rundgren, Yes didn’t play all their top hits, but they put on an interesting performance filled with creative, quality music. Rick Handler is the executive producer of Entertainment Central and enjoys seeing interesting concerts.